Growning up I was never found of eggplants. This was only preparation that I enjoyed when my dad made this recipe. Even after so many years, it is one of the few eggplant dishes I still like making. It is super easy and just involves adding spices on the sliced eggplant and then roasting it in a preheated oven or on stove until all golden & cooked. Lately I have been craving eggplants and cooking variety dishes using eggplants atleast once a week. The sweet aroma of eggplant roasting in the oven just makes me hungry. The soft and tender insides, the crispy outsides, and the golden color is unbeatable and can be convert anyone to start eating vegetables. This dish can be served alongside with some lentils and rice or even khichdi for an easy meal. Also, you can eat it with your salad or make a nice sandwich. Traditionally it is made on a stove roasting it crispy outside and soft inside, but i have roasted it in the oven and it tastes absolutely delicious. Cut the eggplants into thick slices or wedges. 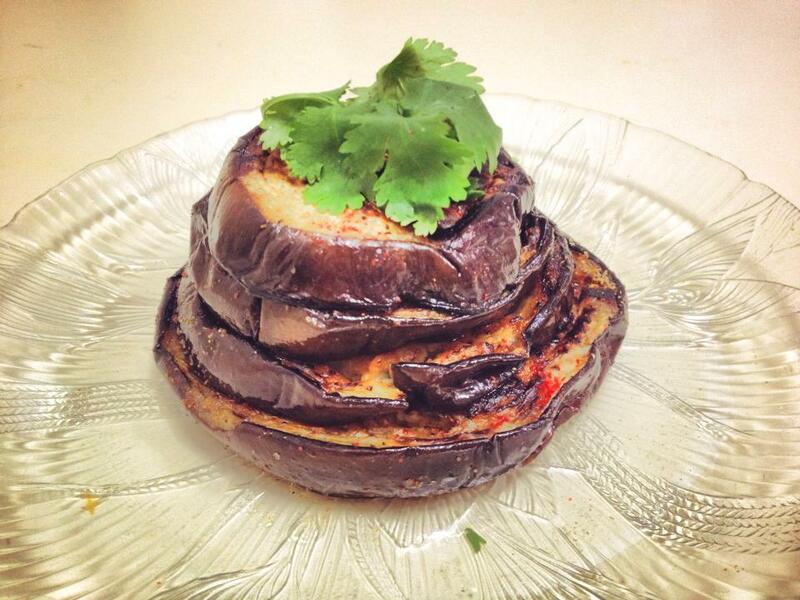 On the stove top lay the eggplants and drizzle little oil on top of the eggplant slices. After grilling one side apply the spices while other side is cooking. Grill until crispy outside and soft inside. If you are using oven than preheat the oven to 400 degrees. Lay out the eggplant slices in a greased baking pan. Mix all the spices in a bowl and apply generously over the eggplant slices. Drizzle olive oil all over eggplant slices and bake in the oven until all golden (approx. 15-20 mins). P.S. make sure not to burn them. Serve warm as a side dish or in your sandwich or salad. Enjoy!